Cards: ProSet 1991, ProSet 1991 Pieñsalo! 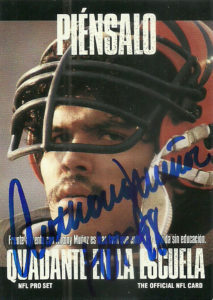 Anthony Munoz was a fixture in the Cincinnati Bengals offensive line at right tackle for 13 seasons. Drafted out of USC in 1980 with the third overall pick, Munoz helped block up front for the diverse Bengals offense, that over the years added major pieces to help them reach two Super Bowls. Along the way he earned numerous Pro Bowl and First and Second Team All-Pro Nominations (1981-1991). He was named the NFL Man of the Year in 1991, and was named to both the NFL All-1980s team, and the NFL’s 75th Anniversary team. He attempted to play one final season with the Buccaneers with his former head coach Sam Wyche in 1992, but a nagging shoulder injury prevented him from playing out the preseason. Arguably however, Munoz is considered the greatest offensive lineman ever to play the game. 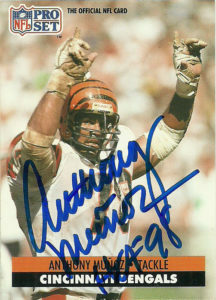 I never thought I’d get Anthony Munoz autograph. Thanks in part to my friend Deadhorse, I was surprised with two. Munoz is difficult to attain through the mail, partially because he makes you jump through so many hoops filling out charitable paperwork, and the other part due to the cost. He has some great cards from over the years, but these two from ProSet were very nice. While I used to heckle the Piensalo one, it really is a well executed design feat in the years prior to Photoshop dominance. Overall however, Anthony has a very solid autograph. Anthony has remained active in the community since retirement and has his own charitable foundation. He also does color commentary for many of the Bengals preseason games.